Her was great and not what I thought it would be, but in the best way. I think one of the best choices the Spike Jonze made for Her was having it set in a not-too-distant future, or possibly some kind of alternate current time period. Before seeing it, I thought the plot was more about a guy falling in love with Siri, which, considering Siri does little to nothing for me, I wasn’t sure how that was going to pan out. In reality, Her is about Theodore (Joaquin Phoenix) falling in love with an operating system that is unlike any operating systems we know of right now. Samantha (the voice of Scarlett Johansson) is an OS that converses and evolves; she develops feelings and reactions while still maintaining features of a computer (like reading books in milliseconds). 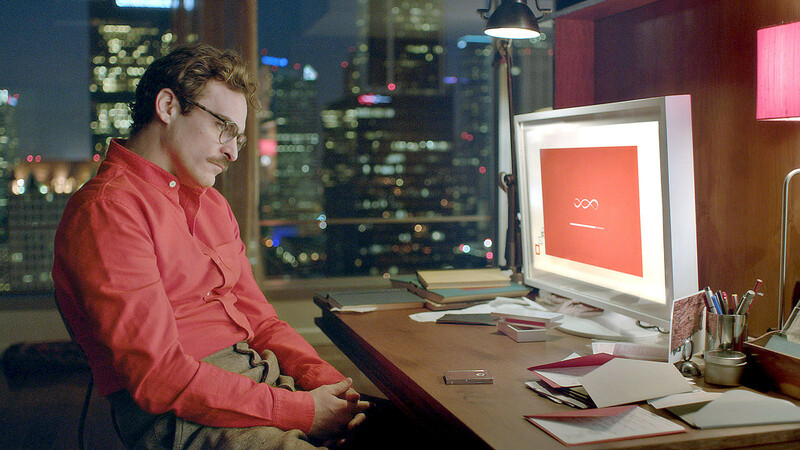 Why I think making Samantha not Siri, or really unlike anything we know of now, was such a good choice on Jonze’s part, is because it shifts the conflict. If Her was set in the present time, in our present universe, and Samantha was Siri-like, the conflict would be similar to that of Lars and the Real Girl; how do we get this crazy guy to realize he’s in a fake relationship? But in the universe of Her, these OSes are common, therefore relationships (both friendly and romantic) with them are common. In a great scene, Theodore is introduced to his co-worker Paul (Chris Pratt)’s girlfriend, and they invite Theodore and Samantha on a double date. Theodore tells Paul that Samantha is an OS, and without skipping a beat, Paul says “Cool,” and continues to plan the date. It’s really like if Chris and I asked a friend and the friend’s new girlfriend out and he told us his girlfriend was in a wheelchair, or blind or something. It’s like Paul understands why Theodore is mentioning it, but it’s a non-issue. So, with that, the conflict really becomes about how can Theodore make this relationship work, rather than how can Theodore snap out of it. Considering most of the movie is Theodore talking to just a voice, Her can be pretty intense and emotional. Joaquin Phoenix is really kind of amazing in it; you really feel how confused and in love he is. And I have to say, I generally don’t notice set design or costumes that much, but I loved all of that in Her. The environment created for the Her universe is just so great: plain, clean, solid colors. It feels very real but futuristic at the same time. At the end of Her, I was very happy that the person I’m in love with has a body and is human. But now I have the stomach flu and the thought of being without a body sounds awesome. Regardless, Her is probably not as weird as you think, and it’s real good. This movie is pretty intense. I think this movie made it so easy to relate to. I especially relate to Joaquin Phoenix’s character in the way that when he’s angry or upset he just does’t say anything or says it’s okay. This movie really did its job. I was expecting it to be kind of boring and embarrassing but it was so real. And I love that he doesn’t hide the relationship ’cause it’s just a thing that is happening in this world. It’s really beautiful in great ways and in really sad ways. If you have not seen it I would really recommend it, I think it’s in my top five I’ve seen this year (Spring Breakers and A Madea Christmas being at least two others).